This from the preface of The Landscape Lighting Book, written in the first edition in 1992 by Jan Moyer, is a poignant statement about our connection to the exterior. We have a strong connection to the environment rooted in our evolution, and with all of the technologies bombarding us from every direction we spend less and less time connected to that environment. So much of our day is spent at our places of work, in meetings or tied to a computer terminal, where we rush to squeeze in a workout, pick up the kids, take them to sports or piano practice and then home for a quick dinner and speed through the evening routine. By the time we have a moment to relax, our yards are dark and our windows become a reflection of the interior of our chaotic households. 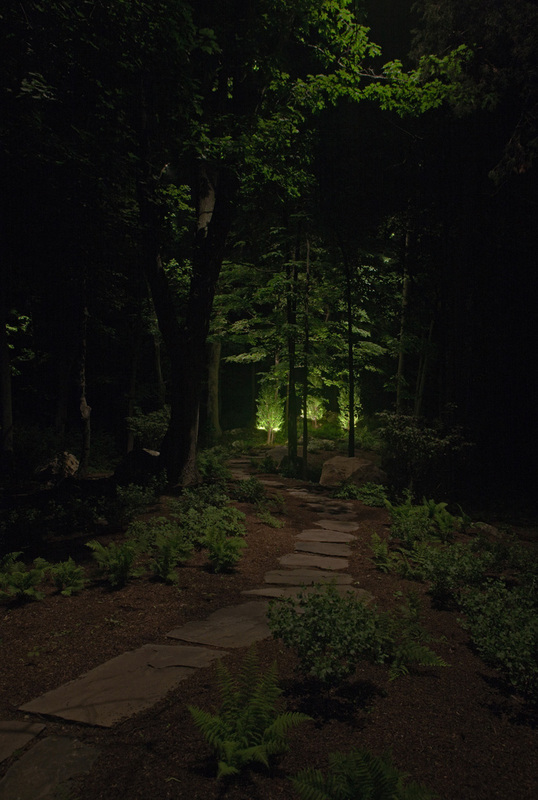 By lighting our landscapes, we can extend our lives to our exterior, slow down and reconnect with nature. We can enjoy a meal on our back terrace, listening to the cicadas as the kids unwind after the first week back at school. Or perhaps we can escape with a cup of tea or coffee, or even a glass of wine, after the dishes are done, the kids are in bed; and reconnect with our spouse about their day and maybe even some of those goals and dreams that have been set by the wayside during our hectic days. And possibly walking the family dog is no longer a chore because the obligatory “getting the business done” feels like a romantic moonlit stroll through the yard. And when we illuminate our exterior environments, we can extend our view from the interior to the exterior, turning those windows back from the mirrors to the translucent glass that reminds us of what awaits us in our yards. We don’t realize how much our yards mean to us until we can no longer stroll in them. We had a client who became bedridden and her windows became her only connection to the outdoors. When the lights inside were turned on at night it was a constant reminder of her confinement. But when the lights outside would come on her evening world expanded into her gardens reminding her of the scents of the roses and gardenias, and revealing the majestic beauty of the grand oaks, and transporting her to the magical world in her own backyard.